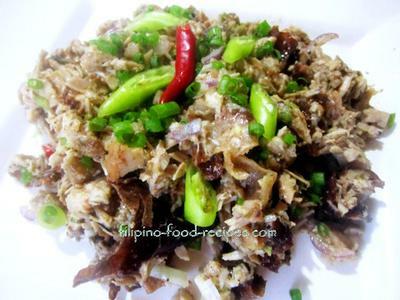 Lechon Manok Sisig, my variation of the popular dish Sisig, is roasted chicken with liver spread and calamansi or lemon juice and mixed in melted butter. It was one of my recipes borne out of a need to recycle a dish, gave it a new twist so my kids would eat it. A balikbayan aunt was supposed to stop by the house for lunch (straight from the airport) with a jeep-load of welcoming relatives. Since there was no advance notice, Lechon manok was the quickest dish I could serve, together with some soup I whipped up quickly. Unfortunately, there was a change of plan at the last minute and they decided to cancel. We were left with 4 lechon manok for 4 people to consume. So, what did we have for lunch? Lechon Manok. How about dinner? Lechon Manok, too. Then the following day, my son was already complaining because he knew there were still leftover roasted chicken. So I de-boned the chicken, sliced into bite size pieces, added onions, calamansi juice, salt, pepper and liver spread, then poured some melted butter to so it's not at all dry -- it was certainly a hit! It is now one of the most requested dish, a favorite in my house! 1. Debone the chicken and chop into bite size pieces. 2. 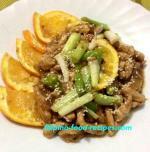 Add the calamansi juice, onion, liver spread, salt, pepper and chili peppers. 3. Melt the butter in a pan and turn the heat off. 4. Add the chicken and stir to mix thoroughly. Note: If you have freshly cooked Lechon Manok, I suggest to skip the butter or cut back -- I added it just to keep it moist since they were leftover chicken.